Sir Mick Jagger and some of his close friends, including Dave Stewart, paid tribute to L'Wren Scott at her funeral in Los Angeles yesterday. Sir Mick Jagger and some of his close friends, including Dave Stewart, paid tribute to L'Wren Scott at her funeral yesterday. The Rolling Stones rocker (70) was supported by his children, Karis (43), Jade (42), Elizabeth (30), Georgia May (22), James (28), and Gabriel (16), at the private service at the Hollywood Forever Cemetery on yesterday. Mick spoke about his love for his girlfriend of 13 years and shared memories of their time together at the "intimate" and sombre service, which was led by Revered Ed Bacon from the All Saints Church in Pasadena, California, according to PEOPLE.com. Eurythmics guitarist Dave later accompanied Bernard Fowler, a backup singer that has appeared on more than 30 albums with The Rolling Stones, as he performed the song Will the Circle Be Unbroken while Karis read a poem and Jade read Psalm 139. Other speakers included L'Wren's brother Randall Bambrough, and her close friends, including talent agent Justinian Kfoury, costume designer Ira M. Hammons-Glass and creative director Adam Glassman. Mick's grandchildren Mazie and Zak also read Psalms, and the late fashion designer's niece Hannah Bambrough read Shakespeare's Sonnet 18, Shall I compare thee to a summer's day? during the service, which was attended by 60 of the 49-year-old star's close friends and family members. A source previously revealed that security was extremely tight at the cemetery, explaining: "All the cars entering are getting checked by security and the trunks are being searched. The main gates are closed and only certain cars are being allowed onto the premises." 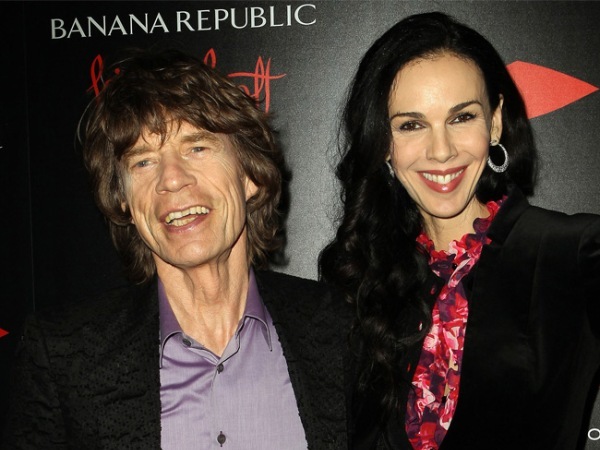 LA is a special place for Mick and L'Wren as they first met there when she was hired to style him for a photo-shoot in 2001. The singer, who was on tour in Australia when L'Wren committed suicide in her apartment in New York City on March 17, released the following statement last week: "I'm still struggling to understand how my lover and best friend could end her life in this tragic way. We spent many wonderful years together and had made a great life for ourselves. I will never forget her."